While Mathare is approaching with fierce speed the Kibera teams are working hard to set up the Trust, struggling to create their basic visions and missions, developing their personal goals, thinking of ways to get their work across into the community (something that hasn’t been done yet) and preparing to train others. Working on two fronts is going to be, well let’s say challenging. But how much excitement and effort can we really expect from our teams to do something we feel is good, maybe even good for them? When asked what their vision, mission and goals are all I hear is the mantra they picked up along the way about how they want to contribute to open data and sharing of information and being the eyes and ears of the community etc. But do they really know and understand what this means or are they just repeating something they were told is good? After all they are going to be the messengers to their communities and based on their messages the communities will react. We say we’re doing this to see how open data can influence the marginalized communities to better advocate upon themselves. But what do they want out of this? I know people have been trying to answer these questions before but it’s somehow different when confronted with faces in front of you, it’s much more personal. On our meetings I challenge them and ask them what their personal goals are. What do they want and expect from the programs? Do they want to volunteer in these programs forever? What are they doing to distinguish themselves from the thousands (if talking of You Tube millions) of others who are doing the same? When asked this question they usually answer that they want to get paid or get paid jobs, be famous, travel the world etc – these are real dreams, real life goals. And aren’t we doing this so we can empower members of this community to advocate upon themselves and to have a better chance when competing with the luckier and the richer comrades? That is why we’re now trying to make them look at what they are doing as a business, a marketing of their skills. They need to sell their ideas and their talent. They have the opportunity to do that through the programs they are involved with. They can still be the eyes and ears of the community and still influence change but they also need to think about the sustainability of the programs which will be achieved only if they are satisfied with what they are doing. So the discussion in the past week has been how to raise awareness about Map Kibera’s programs while putting the skills and ideas of the three groups on the market. The Mappers will raise awareness through Atlas distribution. They plan to do this through a publicity gaining “Atlas launch” to which they plan to invite government representatives, NGOs, UN representatives, community leaders etc. They will ask for small contributions which will be used to print more maps. They also want to distribute the Atlas and hold lectures in schools of Kibera, identify public places to post maps, start public discussions regarding the data collected by organizing community meetings, and they even plan to start a discussion regarding naming the streets in Kibera. Last but not least they want to re-do (update) the map. The video team wants to start weekly public screenings to showcase their talent and present their work to the community and hopefully start discussions around the stories and events they collect. Voice wants to set up stands and distribute flyers and stickers to publicize the number. All of them want to train others. It’s serious stuff and hopefully something good comes out of it! And while the Kibera teams are thinking hard about all these issues, Mathare is like a bee hive, full of expectations, ready to go to the moon. The venue for the forum is reserved and people are being invited. The forum will take place on December 1st and will last about half a day. We’ll start with introductions from Rose and Simon (CCS and COOPI). CCS will than facilitate “mapping with the feet” , a participatory exercise that asks participants to place themselves within a room with relation to their geographical position in the community in question, to show the participants what mapping is in the simplest of way. The Kibera teams will then present what they did in Kibera and invite people to the stands where they will showcase the equipment and methods and answer more questions. In the end we will open the stage for discussion. Anyhow it’ll be interesting couple of months. At the moment there are more questions than answers, but hopefully by the end the tide will shift. Oh… by the way, Mikel and Erica left. Sorry for us. I have decided I’m going to post my working diary or my weekly reviews for a number of reasons. First reason is transparency. I want my work to be transparent, out there, without secrets. Second is advice. We’re working in different terrains than the ones we come from, meaning geographically and culturally, and we need advice from people in order to better understand the places we work in and to minimize the conflict. It’s also good practice to keep track. Last but not least is that we DO want our programs to be replicated in as many marginalized areas as possible and this will hopefully be a good reference point for how to do it. To keep everybody up to date I’ll start by shortly summarizing the work we’ve done (mostly the work I’ve been involved with) in the past couple of weeks. The most important task that lies ahead of the whole team and the teams in Kibera is working on sustainability of the three programs (Map Kibera, Voice of Kibera and Kibera News Network). This means that we’re working with our teams on strategic vision and mission, future activities, internal structure, budget and fundraising, and procedures for recruitment and membership. It’s not an easy task by any means; it takes a lot of our time and nerves but it’s a necessary, crucial and probably the most important step of the programs. I’ll let my collegues Mikel, Erica, Jamie and Jane talk more on bureaucratic issues and the fun they have with lawyers and other administration people. 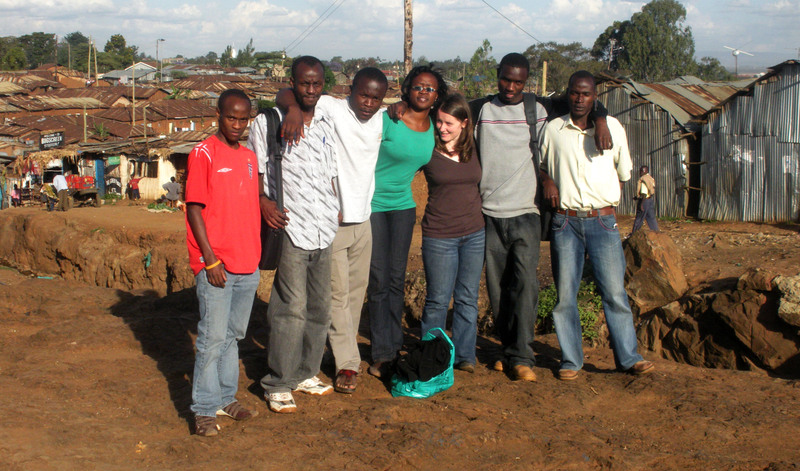 We’re still working on an Atlas of Kibera with Emma Engelson, who used to work as an intern at UN-Habitat. The Atlas will contain 5 maps focusing on health, education, water and sanitation, security and religious institutions and an additional poster with a big map and detailed description of the project. 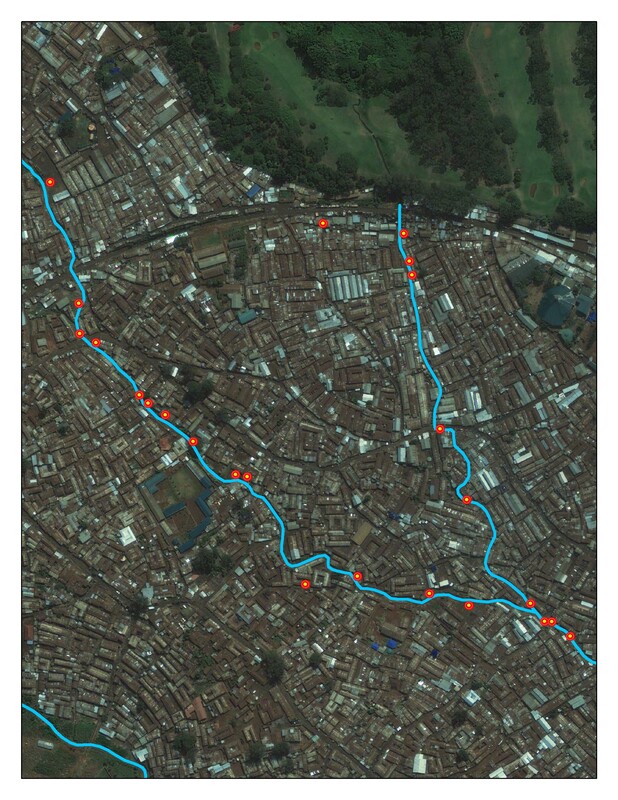 It’ll then be up to our mapping team to distribute the Atlas in Kibera to schools and NGOs and others, and to talk and hold lectures about the data they’ve collected in order to build the communication around it with different stakeholders and other interested parties. In other words they need to make this data now come to life. We were also working on the publicity of mapping and all the other programs – we understand it’s important to be out there, we need to make the community know who the Map Kibera teams are and understand what they do, let them know where to go to obtain data and where to go to put themselves on the map or get their voices out there. For that purpose we’re working on a comprehensive media launch for Voice of Kibera and Kibera News Network and also on making maps visible by displaying them on public places, walls etc. Another big task! Another issue concerning Kibera programs is trainings in Mathare. 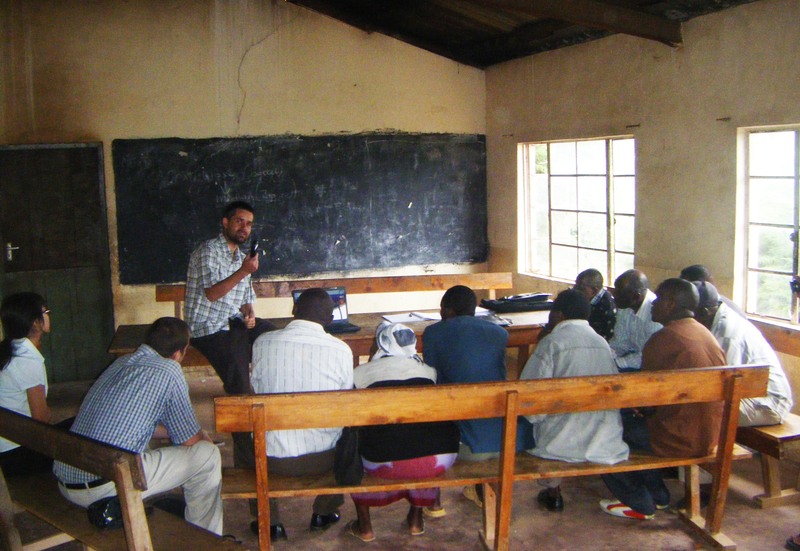 How will our teams participate in the trainings of the Mathare participants? For that purpose we had a three day long work shop with an amazing Dr Mark Skipper from Aptivate on inquiry led learning in an inquiry-led way – sort of training for trainers. I believe all the teams did really well; I also believe they now better understand why working together and expansion is important and inevitable. The details of the training should fit into a blog of its own. I’ve mentioned it above that we are, or better have been, slowly moving our operations to Mathare. In the last month I’ve spend many days roaming Mathare with Simon Kokoyo to find the venue for trainings. I visited a bunch of organizations like Community Transformers, YIKE, NGEI 1, Youth Congress, Mathare Environmental (Pequininos), Rebel Film Board, Nzumari, Community Development Center Huruma, Furaha Educational Center, Maji Mzuri and many individuals. We found some very nice locations for our trainings and people were very excited that a programs like ours are coming to Mathare – which is good news. In order for the programs to become sustainable we “mzungus” must not be the entry point in Mathare. That’s why Rose and Joseph from CCS and Simon from COOPI and Community Development Center Huruma undertook the task of community mobilizing and planning and facilitating activities for an open forum. The open forum will be the entry event, a “trigger” into Mathare programs. Need to mobilize the leaders, elders, chiefs whose role in the program will be the role of community organization and mobilization. Make sure they are informed and give them key selling points (information to direct resources). Gender equality; mobilize young women to the initial forum. Address structure owners, if it comes to it, by explaining to them that we’re investing in their needs (needs like introducing water and sanitation infrastructure). If there is any chance of sustainability of the programs there should be an income generating activity. This is a very delicate issue as we’re not offering jobs but trainings, and the ability to learn new skills. So our message from the start should be, as Simon said, that we’re enhancing value to the existing services and the data can be used to better lives. Start simple at the beginning and then grow. This means we present the skills but let people decide how to use them, we let people to think about the issues and places that need mapping and reporting – this will be, should be, and should stay community driven programs. Preparation of teams in Kibera for the roles of trainers. In other news: we have successfully obtained the satellite imagery of Mathare and had a plan to digitize its borders, with the help of Map Kibera technical team (Hassan and Zach) but in the meeting with Plan, CCS and COOPI it was said not to start with the digitalization of the borders because people need to be somehow included in drawing up the borders of Mathare. I also realized that the villages in Mathare are many and the borders are very disputable. There was even some discussion on what is Mathare area. I raised an issue regarding how big the buffer area of Mathare is and if we need to include the buffer into our mapping efforts. Apparently the buffer area is quite big as people in Mathare depend a lot on the surrounding areas (like business along Juja road or Thika road and parts of Eastleigh) and the decision was that we should include these areas because they are of big significance to the Mathare people. We will still proceed with the digitalization of main buildings and roads from satellite imagery. 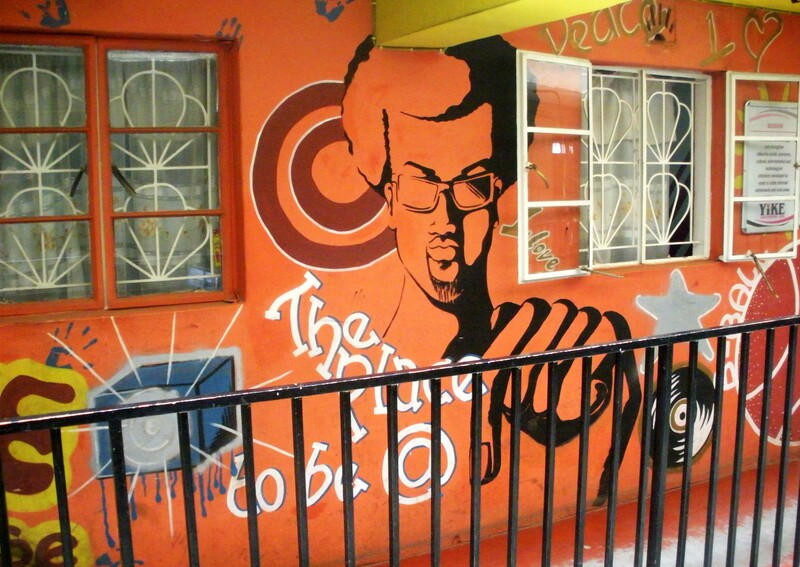 In order to start preparation for the video component in Mathare we visited Rebel Film Board which consists of a group of young people from different youth groups which were trained in video and editing by Owen from Rebel Film Board. We also met with Jeff Mohamed, a young and talented documentary film-maker, Nathaniel who has a lot of experience in filming and video editing, and representatives of Slum TV. They can all be of great help and a big resource in the area of video reporting. We wanted to build a core team around these guys who would be, along with KNN guys, the point personnel of the video component. At the same time, fears were raised that the level of expertise of this group might intimidate newcomers, so while these guys will certainly play a big role, this role is still being defined. There’s more to say and much more has happened, but for the start this should be enough, even too much. The main message should be Kibera is still kicking and it’s getting a new feel to it. Mathare is kicking off. Stay tuned. It’s bound to get fun. I’ll keep you posted. … and feel good about it! 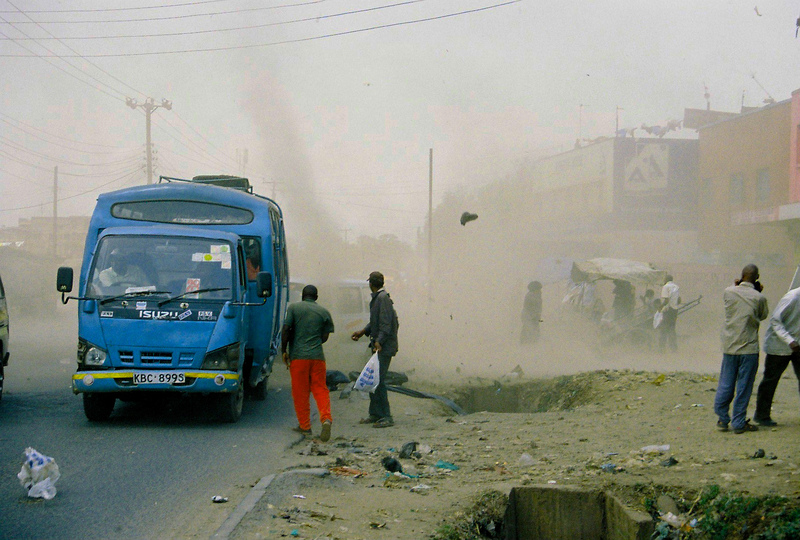 The Map Kibera crew was just about to leave Mathere after the meeting with the representatives of Rebel Film Board, and while waiting for a Matatu to take us back to town a freakish tornado appeared out of nowhere. The wind first started blowing as a gentle breeze coming up from Mathare slum. The breeze started picking up speed and with it dust and sand. And then all of a sudden, from behind the building on our right, a massive burst of wind came from the opposite direction of Eastleigh. 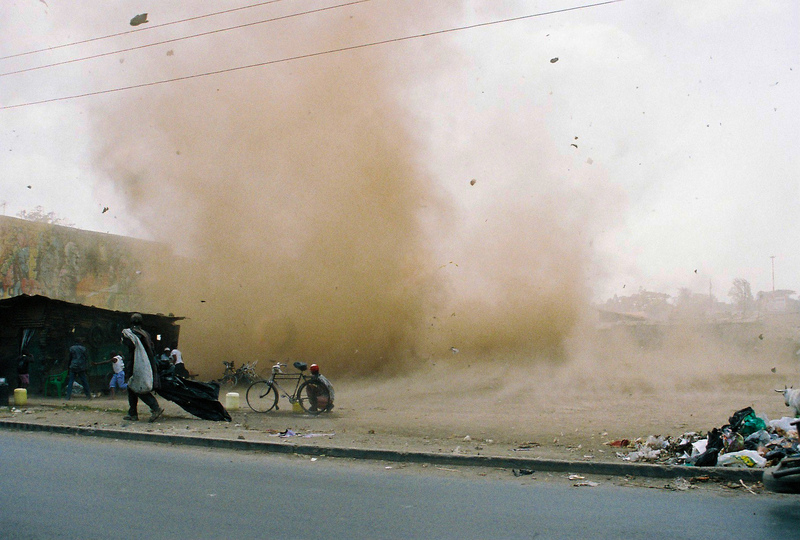 It was a head on collision of winds which got entangled in a crazy dance for prevalence, creating an opportunity to take some cool photos and all the dust of the slum (and God knows what else) to settle on our lungs. 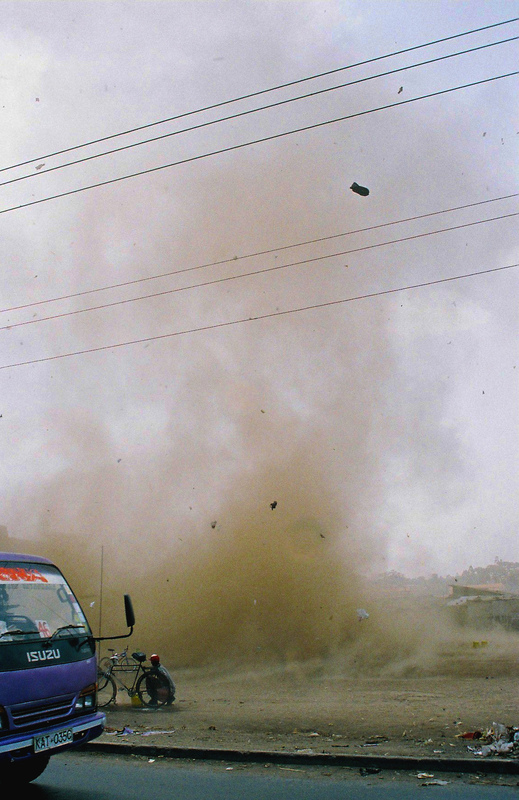 A couple of months ago, a series of storms caused havoc in Kibera. Our team was taking a much needed vacation at the Kenyan coast, and while we were sipping gin and tonic and absorbing the sun and endless blue sky, the people of Kibera were battling against rather less favorable weather up on the high plain of Nairobi. As our team returned to Nairobi, we received a call from the United Nations OCHA Kenya: “We heard there was some flooding in Kibera and Mathare, and since you have a presence there, we’d like you to go and check it out.” We had no idea. So I called one of our mappers, Hasan, and he confirmed the whole thing. The area where Kibera is located is very hilly. 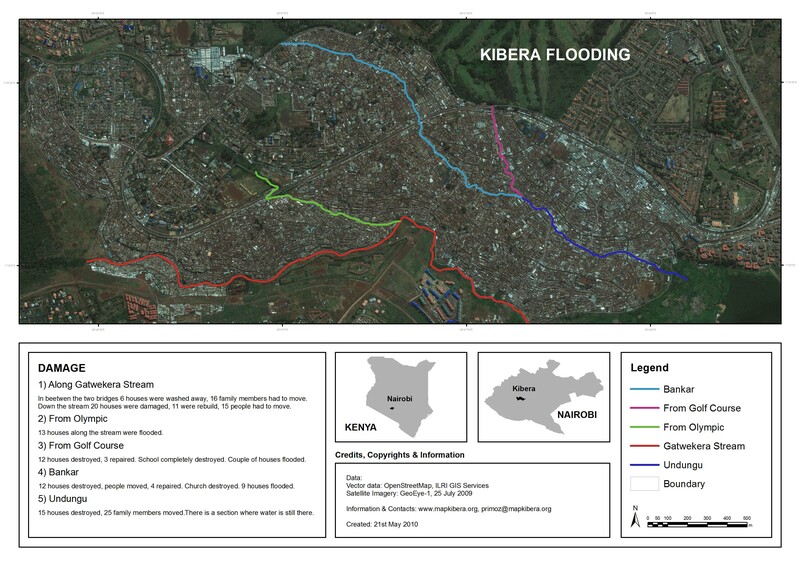 It’s made up of a group of drainage areas intersected by 5 streams, which eventually end up in Nairobi dam. During heavy rains the runoff water travels over the surface of the slum and ends up in the streams. These become overflowing, raging currents, grinding everything in their way, washing away houses, paths, garbage and people. Hasan and I went to check out the damage and collect information. I was overwhelmed. This was a major incident which should trigger massive coverage, but went almost unnoticed, even by us. 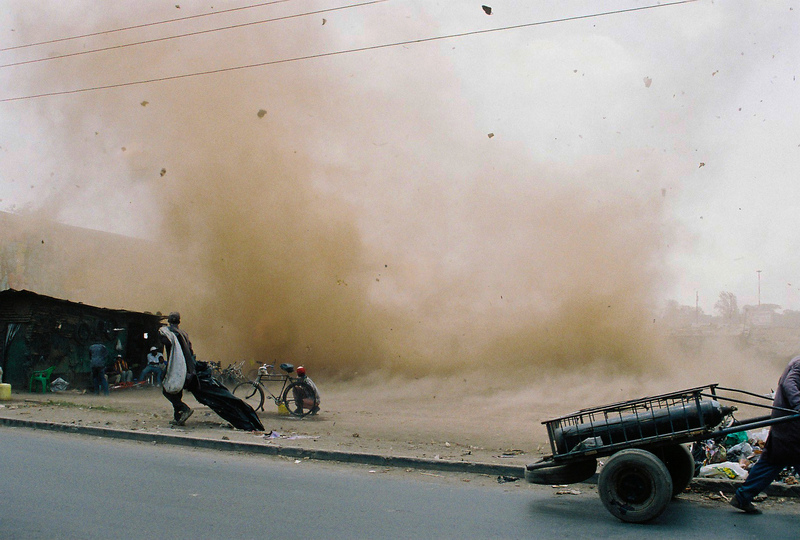 There were more than 50 houses severely damaged, displacing the inhabitants. One school was completely swept away. Walking calmly, I didn’t even notice anything in particular, until Hasan suddenly pointed out that I was standing where only days ago a school had been. Not even the foundations were visible anymore. We started collecting data points of all the damaged objects, which were mostly located on the banks of the slum’s streams. In a testimony to Kibera’s obstinate spirit, many of the damaged objects were already being repaired and rebuilt. The paths inside the slum, too, were being fixed by groups of young volunteers. People organized themselves without waiting for any kind of help or intervention from the outside. Had it not been for Hasan pointing out the repair activity among the usual busy scene of Kibera, I may not even have noticed this almost organic reaction of the slum to its wounds. We decided that we’re not going to take the position of every damaged and rebuilt object across the slum, because it would take too much time, and we had a tight deadline. We focused on the primary damage along the streams, since we could still upgrade the information if needed, depending on the feedback. 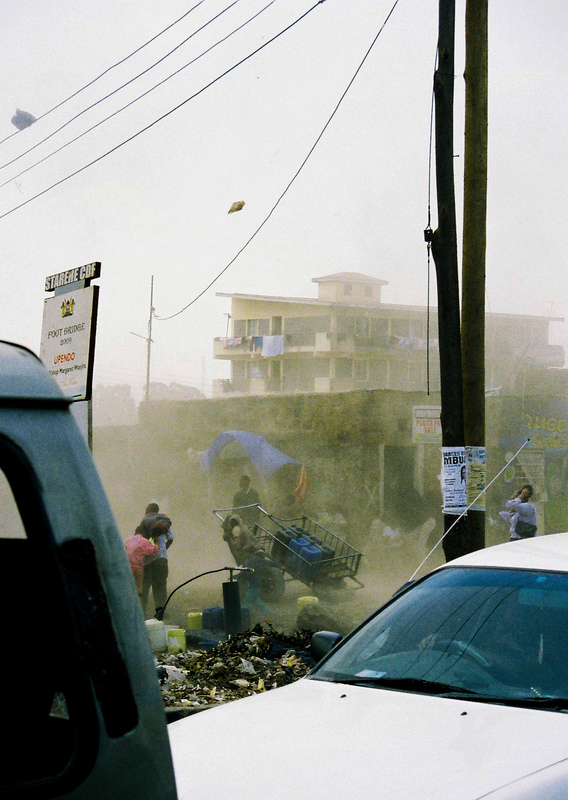 In order to collect the information as fast as possible, Hasan organized his friends around Kibera to go and look around their communities and try to figure out the extent of the damage inflicted by nature’s fury. Within two days we had an in-depth map of the extent of the damage for OCHA. 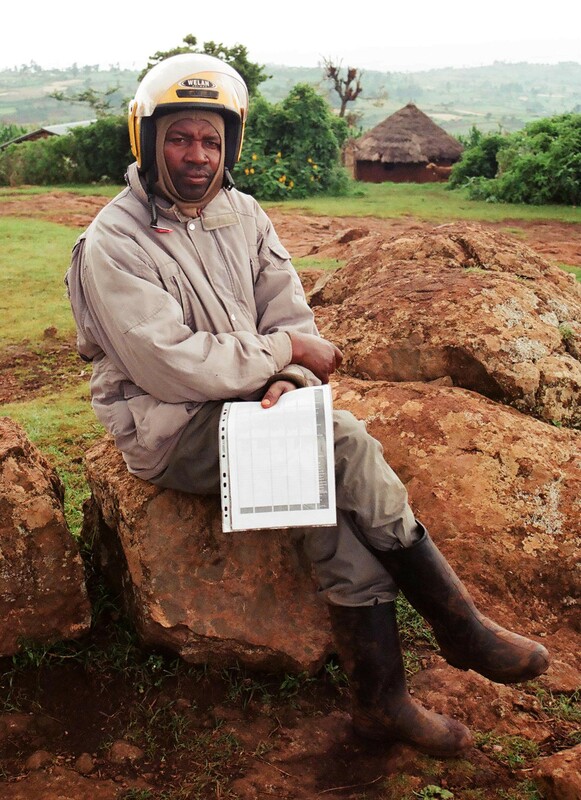 -The importance of having local people on the ground, trained in data collection, which can be activated at any time. Because of this, the time in which information was available to OCHA was shortened to only a couple of days. -The information on repaired objects could be used to make a case for compensations. 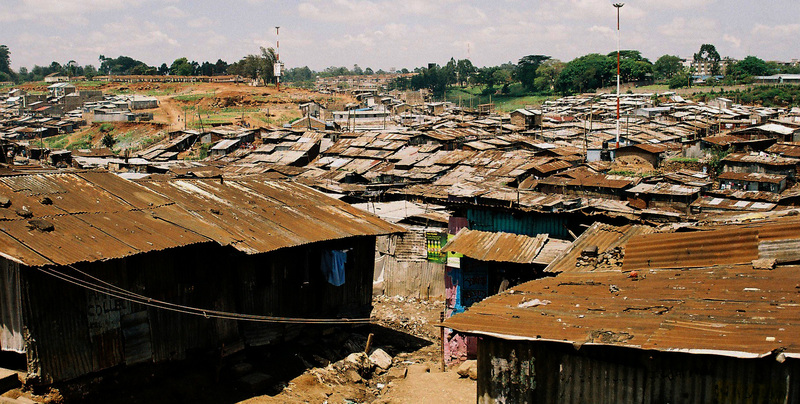 -Visibility matters: Even major events with many deaths and widespread destruction can go mostly unnoticed by the outside world when they affect marginalized places like Kibera. Recording information on damage, be it on a map or through local newscasts and papers, is the crucial first step to mobilize help in support of the local community. 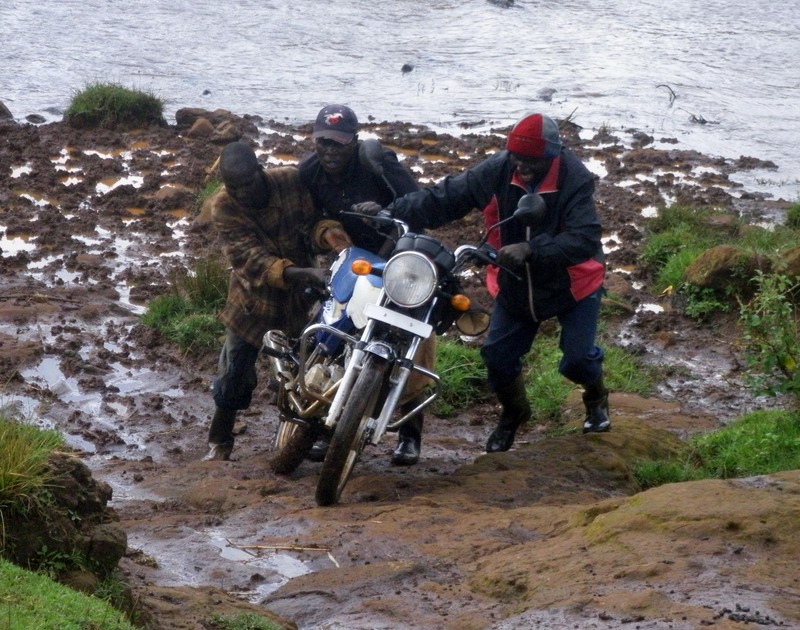 Pushing the motorbike up the rain soaked hill. 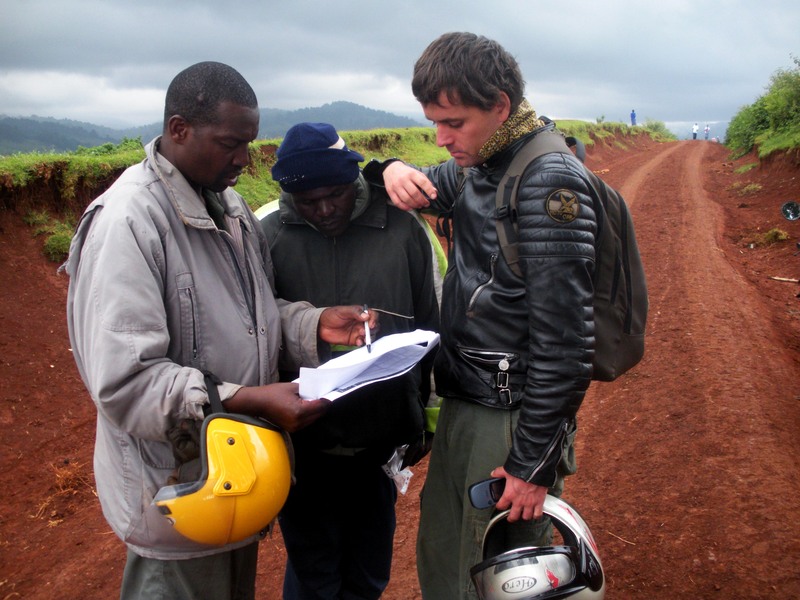 Acquiring maps of the project area is the next important step. It helps you plan your routes, which areas you want to conquer and in what way, and it also gives a rough estimate of time you will spend conducting your work, etc. Many times while mapping remote, marginalized areas you don’t have pre-existing maps because you will probably be the first one crazy enough who will try to create them. 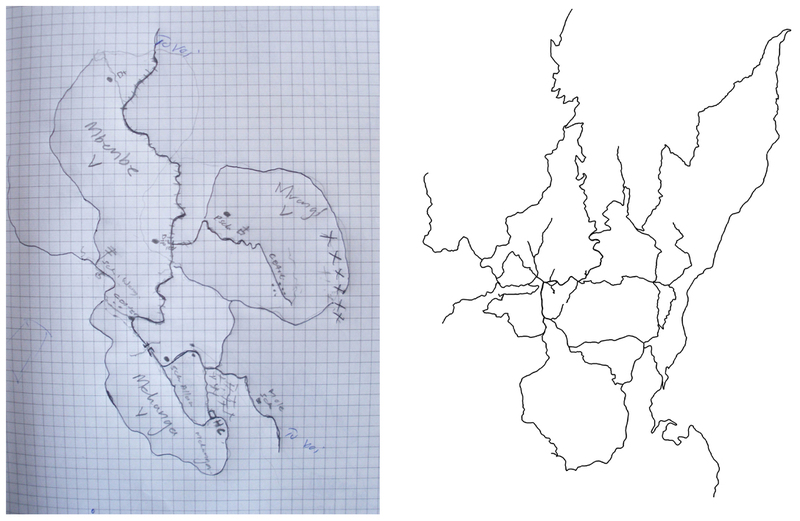 If you can’t find any maps of the area, there is one very usefull trick you can do: make people draw the map from memory. This produces amazingly accurate and helpful rezults. Amazing in a way that people who rarely see maps or who have never seen a map create very detailed and precise drawings – maps – of their sorroundings from memory. We didn’t really have any pre-existing maps of the area to work with before going to the mountain. There are no maps of the area and even though the NDI had a map of polling stations in the area, there was no road network on the map. This time around I didn’t ask people to draw me a map as I did on the other occasions (example below: Wongonyi) because the area was too big – roughly 400 square kilometers. If possible make contacts in the area prior to your arrival, that way you recruit people for the cause even before you arrive. This step is called: “smooth landing”. I contacted a friend of mine, Stephen, whose family lives in the area. He gave me his brothers’ telephone number. He also called his brother and made him aware of my arrival. His brother than informed community leaders and at the time of my arrival the wheels were already turning. Make community leaders aware of your presence in the area and the tasks you are trying to achieve. Tell them about your needs. Make a plan on the sequence of mapping – which areas to tackle first and so on. They will serve as a connecting line to the community; provide guides, accommodation, transportation, and information. Keep them up to date with the problems you encounter. Aaron from NDI and I met community leaders on the first day. Aaron did some explaining around the project, while I talked about the technical issues. They set us up with two drivers who also served as guides, planned the first reconnaissance of the area, and set me up in a guest house. Next day I was able to start working. This is probably the most crucial step. You need a really reliable person while moving through uncharted waters – which by the way are his playground since he was a child. The guide needs to know the project in depth as he will serve as an interpreter, guide, and guard. Pay all his costs and give him a daily salary – pay him a little extra to make him happy and motivated – it pays off! The community leaders set us up with two really classy guys. Obviously they know the people there and know who is reliable and basically who is right for the job. I couldn’t be happier with the guys I was to spend the next week mapping the mountain with. Their names were Philip and Joseph. Philip was an ex policeman who knew the mountain, the history and the people inside and out. Joseph was his side kick also familiar with the surroundings. We went through some really tough times – always with a smile on our faces (I was smiling only after crying). 6. Go to a local bar and have a beer. Next step is a bit unconventional but is the way I do things. Go to a local bar, meet people, have a beer or two or three (three is better), buy a beer or two or three (three is again better), relax, show people what an awesome person you are (of course you are! ), relate to them, talk to them about the project, hear them out what they have to say about it. If the chiefs haven’t informed the people about your presence yet, this way everybody knows you by the next morning and you’ve gained the support of the community – guaranteed. This was easy because Philip wasn’t just an awesome guy who knew everybody and had the upmost respect of the fellow Elgon dwellers, he also owned the only bar which served alcohol in the area. We were ready to set sail. Map like crazy! Take notes, pictures and videos of road conditions, infrastructure you are mapping, and events you encounter on the way. Talk to representatives of these institutions, talk to people, get additional information, and write everything down! And so we did just that. We mapped until there was nothing left to map. No seriously, there is always more to map, so let me correct myself: we were mapping until we finished our part of the deal. Mapping itself was by no means smooth, it was interrupted on a daily basis by rain and too much sun and then rain again, and occasional mob justice (this story is on my other post – the horror stories and nightmare tales), and dancing or singing coming from the bush, and punctured tires and falling from the motorcycle, and … But we moved on despite all the obstacles and we mapped, and we looked at what we created, and it was good. And on the eighth day we rested. Each day after work write your observations into a working diary. Save all the data and prepare for the next day. That is something I never do, and I really should. It makes a difference between a good and a mediocre mapper/cartographer. Ha, whatever, no it doesn’t. I think it’s very time consuming and that it’s very nerdy. 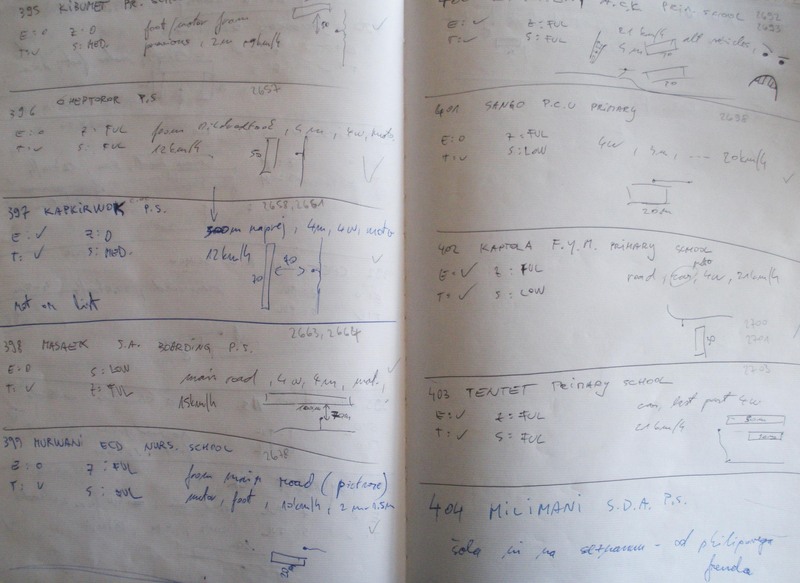 Taking notes while you’re on the go is one thing but a diary – you must be crazy. But if you’re working on a long term project and you think you will not be able to remember every small detail, than by all means do it! In the end present the drafted results to the community and talk about it. Collect all the feedback; listen to what people have to say. I met with community leaders and all interested parties couple of times. I showed them the drafted maps, again explained the importance of the project, and thanked them for all their help, time and patience. And afterwards we drank beers again. I looked at the work we did and the people I met, and the friendships which were born and again I realized how rewarding this kind of work is. Make a map or whatever the hell you’re doing in a reasonable time period. Talk to Mikel why uploading everything into OpenStreetMap doesn’t hurt. Here is my example of Mount Elgon. Staying in touch reassures the people that your work will benefit them somehow. You will also be doing a favor to all the people that will be focusing their work later in that same area. Nobody ever expects you to return or to stay in touch. It’s rude not too. People get the feeling that they were used and forgotten. Make occasional phone calls, links to your work, etc. It doesn’t hurt. To wrap it up. In a nutshell: Good preparations makes a difference! Community envolvement makes a BIG diference! And the most important thing: You are a visitor to this places – let them lead you. Embrace the knowledge the people have about the place – geographically and culturally – and grow. Good luck and have fun mapping. I’m out!